After leaving Madeira on August 04 in the evening (17.37) Lifgun is heading east toward the african cost. Easterly winds with around 4 bft. Sailing right in between the small sister islands of Madeira is a great experience. This desert island are looking great. Sailing all the time upwind is tough - but no chance to change anything. It's extremely hot - a sign that we really are on the height of southern Morocco. Lifgun is sailing well - the days are more or less quite and the nights just wonderful. As we reached the cost zone of Marocco - we first hitting a fishing net which stops us in just seconds - drive backward is solving the problem. On August 8 - we were sailing around 10 nm west of Tanger - it was maybe 20.00 h UTC - the breeze increased to 30 knots. On the nose as usual....15 minutes later the wind was already up to 45 knots. This means force 9. Big seas were building up. Sailing became extremely wet. Almost no forward moving. However - after fighting for two hours with the situation - the wind went up to force 10 in gusts (which means around 50 to 52 knots) - we decided not to fight anymore and were lay to. Water was flying around us...heavy traffic with commercial vessels around us - and noise. after lay to the situation was calming down (for us) both the gale was hammering the whole night and slowing down until noon next day to force 8. Never had such situation before - not sure if this is a wishful experience - but again - the boss is called nature ! Lifgun was doing extremely well during this gale. Never had any doubts during this hours. However we arrived in the afternoon at Smir and we were completely happy to kiss land again ! Sailed 843 nm from Madeira to Smir in Marocco. After4 days and 20 hours sailing. Used the Motor for around 6 hours. 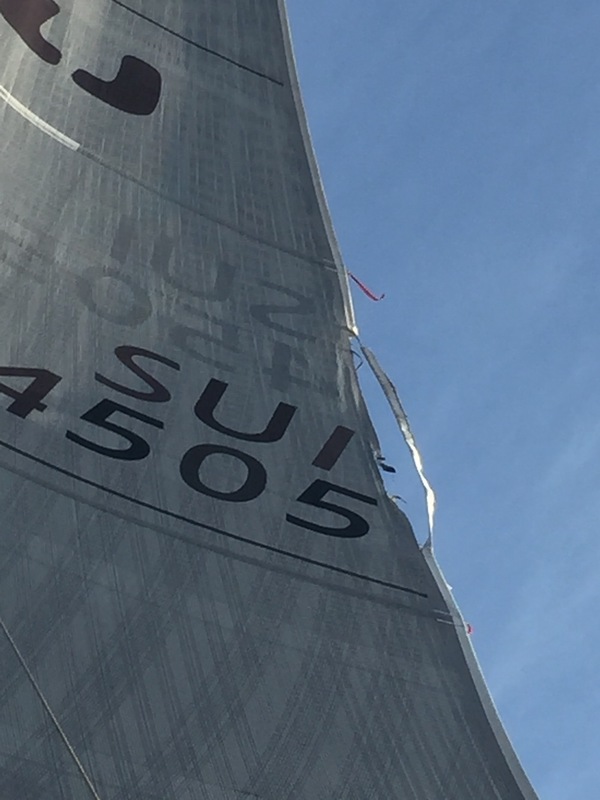 List of damages : Mainsail ruptured - bow thruster is leaking - the big bangs on the boat shows that this fancy feature is nothing for offshore sailing. When the boat is crashing down for meters the bow thruster engine hammers like crazy on the boat - sooner or later there will be alway a damage. However the decision was taken to ripping out this fancy luxury tool and stay therefore on the safe side in a structural way.